We’d love your help. Let us know what’s wrong with this preview of Harvesting Hope by Kathleen Krull. Cesar knew t Cesar Chavez is known as one of America's greatest civil rights leaders. When he led a 340-mile peaceful protest march through California, he ignited a cause and improved the lives of thousands of migrant farmworkers. But Cesar wasn't always a leader. As a boy, he was shy and teased at school. His family slaved in the fields for barely enough money to survive. To ask other readers questions about Harvesting Hope, please sign up. describe 2 ways prejudice can hunt people? Truly, this is one of the most informative and moving non-fiction picture books I have read to date. While I had of course heard of Cesar Chavez before reading this book, I knew next to nothing about either his life or La Causa. This might be primarily because I am a resident of Canada, but when one considers the fact that so much of the produce in Canadian grocery stores is not grown in Canada, but in the United States and other areas, the living and working conditions of farm labourers everywh Truly, this is one of the most informative and moving non-fiction picture books I have read to date. While I had of course heard of Cesar Chavez before reading this book, I knew next to nothing about either his life or La Causa. This might be primarily because I am a resident of Canada, but when one considers the fact that so much of the produce in Canadian grocery stores is not grown in Canada, but in the United States and other areas, the living and working conditions of farm labourers everywhere should be of prime importance, should be of global significance. I am actually (and remain) in awe that a non-fiction picture book could have such an engaging, enthralling and informative narrative, combined with illustrations both luminous and evocative. This book is truly a treasure and represents not only a moving story, but also a most valuable teaching tool, as it shows not only the life, struggles and contributions of Cesar Chavez, but also the living/working conditions of migrant farm workers in general (themes to be discussed and debated). Harvesting Hope chronicles the story of Cesar Chavez, from his childhood in Arizona, to his leadership in organizing a 300-mile protest march to Sacramento, California. Once Cesar’s family moves from Arizona to California and become migrant workers, his whole life changes. He begins to realize how poorly paid and treated his family is, and these struggles greatly affect him. Cesar never loses hope, and as he enters adulthood, he works towards making a difference. He begins to speak out on the be Harvesting Hope chronicles the story of Cesar Chavez, from his childhood in Arizona, to his leadership in organizing a 300-mile protest march to Sacramento, California. Once Cesar’s family moves from Arizona to California and become migrant workers, his whole life changes. He begins to realize how poorly paid and treated his family is, and these struggles greatly affect him. Cesar never loses hope, and as he enters adulthood, he works towards making a difference. He begins to speak out on the behalf of migrant workers, and fights-peacefully-for La Causa-The Cause. This picture book is beautifully illustrated by Yuyi Morales, the vivid images bring the story of Cesar to life. This is a very well written biography of Cesar Chavez, who founded the National Famr Workers Association. There is a lot of information in this story, making it appropriate as a read aloud for grades 2-4, but it also could be used in a sixth or seventh grade classroom. There are some terms in the book (White Trade Only) that younger students wouldn’t understand, but that would make for a good discussion topic with older students. The story mainly focuses on the organization of the march to Sacramento, but the way in which it is told makes a reader want to research more about the life of Cesar Chavez. His story is truly an inspirational one, and worker’s rights is still a timely topic that should be discussed in the classroom. Chavez was a non-violent advocate; he frequently spoke about the power of words, saying, “Nonviolence, takes more guts”. Readers who enjoy this biography would also enjoy reading a biography of Martin Luther King, who Chavez counted as one of his heroes. I thought this book was quite well done, in terms of explaining to children the terrible conditions that migrant worker had to face, and what Cesar Chavez accomplished on their behalf. How inspiring that the poorest of the poor could - and did - make a difference in the world. In the author's note, Chavez is quoted as saying "We had never thought that we could actually have any say in our lives. We were poor, we knew it, and we were beyond helping ourselves." The author also points out that Chav I thought this book was quite well done, in terms of explaining to children the terrible conditions that migrant worker had to face, and what Cesar Chavez accomplished on their behalf. How inspiring that the poorest of the poor could - and did - make a difference in the world. In the author's note, Chavez is quoted as saying "We had never thought that we could actually have any say in our lives. We were poor, we knew it, and we were beyond helping ourselves." The author also points out that Chavez was not a man without controversy and that not everyone thought of him as a hero. But some did, and still do. This is perhaps not the kind of book that immediately draws children in - it's not "snappy". But it is of high quality, both in the subject it covers and in the illustrations. It didn't bring out a lot of emotion in me as I read it, but it did make me think. Another excellent children's picture book biography from Kathleen Krull detailing the life of Cesar Chavez and his quest to bring fair working conditions to farm workers in the USA. I especially liked the scenes of his childhood and the loss of dignity, family structure, and sense of permanence that came with the Great Depression and the loss of the family farm. It reminds readers young and old that this could happen to you, this could become your story, too. 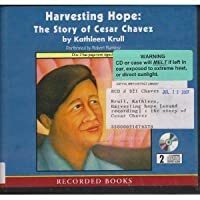 Harvesting Hope: The Story of Cesar Chavez by Kathleen Krull, published 2003. Found via Horn Book Magazine, reviewer not identified. Harvesting Hope provides the life story of Cesar Chavez, beginning with his early life at a family ranch in Arizona. Then, due to a drought, the family had to move to California to work, where conditions were harsh and the workers were never treated fairly. The book recounts how Chavez at first was resistant to the idea o Harvesting Hope: The Story of Cesar Chavez by Kathleen Krull, published 2003. I read Harvesting Hope: The Story of Cesar Chavez and I was touched. I did not know about Cesar Chavez until reading it. I read this book out loud to my husband. This is quite a long picture book with very beautiful and colorful illustrations. The length did not bother me because I was very interested in learning about Chavez. I was touched by what Cesar did for the farm workers. I even got a little choked up by reading it. It is definitely a story that makes you think long after you have put it I read Harvesting Hope: The Story of Cesar Chavez and I was touched. I did not know about Cesar Chavez until reading it. I read this book out loud to my husband. This is quite a long picture book with very beautiful and colorful illustrations. The length did not bother me because I was very interested in learning about Chavez. I was touched by what Cesar did for the farm workers. I even got a little choked up by reading it. It is definitely a story that makes you think long after you have put it down. It is important for children to learn about inspirational people which brings me to my quote. "You should listen to even the smallest voice, someday it could be the one that makes a difference." Thanks to the children's group again for the wonderful book suggestions! I am so glad I joined! I really enjoyed the artwork and the way Cesar Chavez's life was told. One point brought tears to my eyes. I also learned a few things about Chavez that I didn't know. My girls also liked the book. "It is well to remember there must be courage but also that in victory there must be humility." Powerful quote that I loved from this story! 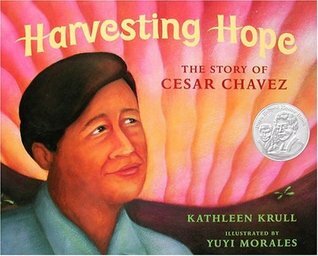 Harvesting Hope: The Story of Cesar Chavez is a Pura Belpré Award winning book written by Kathleen Krull and illustrated by Yuyi Morales. Through realistic text and pictures, the story of Cesar Chavez is brought to life. Cesar and his family lived in the Arizona desert, enjoying food and company every night. Cesar had many friends to play with in h "It is well to remember there must be courage but also that in victory there must be humility." Powerful quote that I loved from this story! 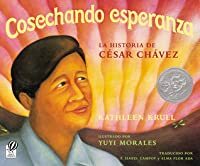 Harvesting Hope: The Story of Cesar Chavez is a Pura Belpré Award winning book written by Kathleen Krull and illustrated by Yuyi Morales. Through realistic text and pictures, the story of Cesar Chavez is brought to life. Cesar and his family lived in the Arizona desert, enjoying food and company every night. Cesar had many friends to play with in his community. Then, in 1937, Cesar's family farm was dried out by a drought. They were out of business and money to survive. He and his family had to migrate across California, working and picking crops anywhere they could. Their days were long and pay was almost nothing. Cesar attended school, only to be discriminated by others because of his culture and language, "I am a clown. I speak Spanish." He left school and decided to focus on work. The terrible working conditions of the farmers made Cesar upset, and he wanted to do something about it. He established La Causa, which was the first movement for farm workers' rights. He fought several times with government officials until he finally got the attention and approval that he needed to create the National Farm Workers Association, which promised better conditions for the workers. Speech after speech, fight after fight, Cesar Chavez was just an ordinary boy who became a hero for so many people. One of the most obvious teaching connections would be to use this book for Hispanic Heritage Month. It's a great read aloud book for grades 2nd-5th. The text is a little longer and more dense, so it might be too complex for the younger grades. I think this story was written in a way that makes Cesar Chavez's story very relatable for young people. It dives into his childhood and the experiences he faced in school that made him work for a greater cause (the rights of his farming people). Definitely would be crucial to have stopping points in your read aloud for students to think and talk about the story- page 6: Cesar is talking to his mom and fighting, mom says "use [your] mind and mouth to work out conflicts" What might this predict or foreshadow for Cesar? page 12: Pause and notice the illustration and relate it to the text "hot spasms shoot through his back... earned as little as thirty cents for the day's work" Make an emphasis on the worker's conditions... Is this fair? What could you even buy with thirty cents today? How would Cesar support his family like this? page 14: Cesar is called out in class for speaking Spanish... talk about bilingual education with students... not discriminating about languages/differences in culture, definitely a good place for turn and talk with a buddy, talk about how they would feel if that were them. Students could also extend this lesson with researching other Hispanic Heritages heroes/advocates. Assign a group of students a country that could be in Central/South America, find someone who worked for Hispanic rights. Side note: I don't like that this book did not include the work that Cesar Chavez's wife also put into the UFW (United Farm Workers Association). Maybe students could include her in their research project as well. I liked how this book was made at a level for kids to understand, and really be able to admire what Cesar Chavez did for his people. It's a great book to talk about social justice- creating equality for everyone (especially for minorities and careers less talked about like Hispanics and farmers). I don't think that I learned a lot about famous Hispanics in elementary school, so this book would be a good introduction to a unit on this. The illustrations in this book are beautiful and so detailed. The characters faces are easy to read and their actions are easy to see. This book is also great to teach kids that anyone can be a hero! Cesar Chavez was just an ordinary boy whose living and working circumstances led him to fight for something bigger. It shows kids that standing up for your rights and fighting for what you deserve will pay off! Anyone can do it. Harvesting Hope: Ceasr Chavez migrated from Mexico to California to work on the farmland. Cesar as a kid was not able to finish school, and once he had moved,it was harder because he didnt know how to speak English. He finished up to 8th grade, he graduated and then worked in the field afterwards. The farmworkers wouldnt get paid much and wouldn't get treated well either, "Anyone who complained was fired, beaten up, or sometimes even murdered." Cesar Chavez then started a strike that fought for Harvesting Hope: Ceasr Chavez migrated from Mexico to California to work on the farmland. Cesar as a kid was not able to finish school, and once he had moved,it was harder because he didnt know how to speak English. He finished up to 8th grade, he graduated and then worked in the field afterwards. The farmworkers wouldnt get paid much and wouldn't get treated well either, "Anyone who complained was fired, beaten up, or sometimes even murdered." Cesar Chavez then started a strike that fought for the rights of the farmers. "Cesar Chavez had won this fight --without violence-- and he would never be powerless again." This book is best suited for children aound the ages of 8-11 which is in the range of second to fifth graders. The book in my opinion would be best for higher elemantary children because the would understand it better then lower base elemantary kids. Harvesting Hope is more complex and higher in difficulty for younger children to read, like kinder gardeners or first graders. Parents might be interested in reading this book to their kids because of the lesson it teaches. Anybody can fight for what they believe is right but there is no need to use violence, exactly what Cesar Chavez did in the story. That was the valuable lesson, and this Harvesting Hope states it pretty clear as it ends. Before I write this, I must admit that I did not know who Cesar Chavez was, and this book was my first source to get to know about him. It is a very well written biography of Chavez, not only because it puts down all his life events in an engaging manner, but also because it highlights various social issues (sadly still relevant almost 80 years later) and more importantly the choices you make through struggles in life. The choice of words is fantastic and very meaningful for our young readers. I Before I write this, I must admit that I did not know who Cesar Chavez was, and this book was my first source to get to know about him. It is a very well written biography of Chavez, not only because it puts down all his life events in an engaging manner, but also because it highlights various social issues (sadly still relevant almost 80 years later) and more importantly the choices you make through struggles in life. The choice of words is fantastic and very meaningful for our young readers. I would recommend it to be used 4-5 grades. So many life lessons can be taught with this book; I particularly like how the idea to resolve conflicts by using minds and mouths and not violence is mentioned. 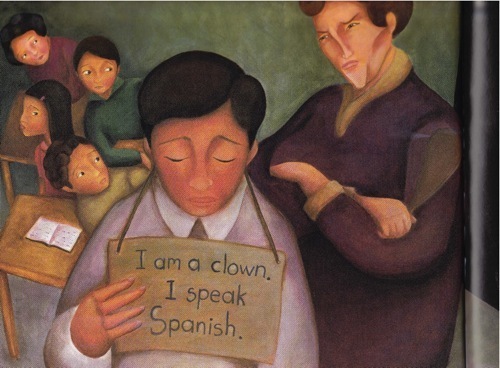 Moreover I thought the illustration of the incident he had in his class where he was punished to speak Spanish by a teacher who hung a sign on him saying ‘I am a clown, I speak Spanish’ was extremely powerful! Educators could use this to teach students about various social issues, including racism, bullying, our attitude towards immigrants and people of different culture and language etc. Educators could also help students understand the central idea of this book; how important it is to have a strong sense of justice and to fight for your rights as well as the rights of those around you. The best thing about this book is how well written and engaging it is! People migrate because of stressful times at their places of origin, and in some cases they themselves are not looking forward to this change; I thought this idea, however subtle, but is beautifully presented in the book. I think this is very relevant to our in our times as well. This biography of Cesar Chavez is that of hope and courage, but you end up learning so much more than just that. I listened to this story on CD, while I followed along with the book. It is the biography of Cesar Chavez, the founder of the National Farmworker's Association. The story begins by describing the carefree childhood of Chavez living on his family's farm in Arizona. When Chavez was ten years old, there was a great drought and his family eventually lost their farm. They were forced to travel to California and work as migrant workers on other people's farms. Chavez found the conditions unbearable an I listened to this story on CD, while I followed along with the book. It is the biography of Cesar Chavez, the founder of the National Farmworker's Association. The story begins by describing the carefree childhood of Chavez living on his family's farm in Arizona. When Chavez was ten years old, there was a great drought and his family eventually lost their farm. They were forced to travel to California and work as migrant workers on other people's farms. Chavez found the conditions unbearable and after struggling for many years, he decided to try to make changes. In his soft-spoken ways and with the influence of his mother and other people who believed in nonviolent protests, Chavez began to organize a strike and a long march to the state capital to fight for better working conditions. He successfully continued his protests throughout his life intil his death in 1979, at the age of 66. I enjoyed this book because, though I recognized Chavez's name, I did not have a clear idea of what he had done to become famous. The book gave a clear description of his influences and accomplishments. The illustrations are colorful and help display his feelings at different points in his life. There is rich vocabulary, such as . . . swarmed, conflicts, migrant, fleeing, coaxing, pilgrimage, suspicious, etc. I would use this book with 3rd through 5th graders to teach biographies or as a resource for any of several social studies topics including history, geography, or civil rights. Harvesting hope is a story about a man named Cesar Chavez who fought for his and the workers' justice. He began a "Huelga" and as they went city by city people began to join those who were fighting which made Cesar's "Huelga" a success. In my opinion Harvesting hope is a great book for those in fourth and fifth grade to read. I believe students will be able to comprehend the story better and realize what Cesar accomplished. 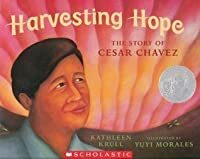 This book won't just teach the students but it will make the reader Harvesting hope is a story about a man named Cesar Chavez who fought for his and the workers' justice. He began a "Huelga" and as they went city by city people began to join those who were fighting which made Cesar's "Huelga" a success. In my opinion Harvesting hope is a great book for those in fourth and fifth grade to read. I believe students will be able to comprehend the story better and realize what Cesar accomplished. This book won't just teach the students but it will make the reader understand why and how the "huelga" made a difference not just on those imigrant workers who faught but to every imigrant worker. Harvesting hope will give a great impact on children because they won't just read the book but they will see what the text really means by looking at the pictures. The images that the book contains are well explain and and has so much meaning that the words in the book matches the images perfectly. The meaningful images was the most part of the book that I enjoyed. I would've enjoyed reading this book when I was in elementary. I personally think I would've been really shocked reading Harvesting hope at a young age because I would've probably been more curious. A few months ago I read this book to a little boy in fifth grade. He was really surprised to know what Cesar went through. He told me that he had known who Ceasar was but didn't really know what he accomplised. After reading the book he felt he knew what was going on and he said he would've wanted to be part of Cesar's "Hulga". "Harvesting Hope" is a picture book that tells the life story of César Chávez in a popular education style. The book does a good job of distilling a lot of information and detail into a story that's accessible to older elementary school students. Also, the illustrations, which are somewhat reminiscent of the murals of Diego Rivera, bring the story to life. The book has more text than the average picture book, and the subject matter lends itself to further explanation and discussion, so this would be appropriate for students who are nearing the end of elementary school. It might even be appropriate in some middle school classrooms. Enough cannot be said about the illustrations. They are colorful, detailed, and emotive. The text reads like a biography or a newspaper article. It is somewhat dry, but the pictures keep the reader engaged. This book would be a perfect way to introduce a unit on or start a discussion on topics like immigration, farmwork, César Chávez, social movements, or social justice. Overall, this is a powerful and important book about a man and a movement that should receive much more attention. Harvesting Hope is the story of Cesar Chavez and what he accomplished for the migrant workers. The book describes his life starting with his childhood on his family’s farm in Arizona. His father loses the farm due to a drought and they are forced to move and find work. Working at a young age, Cesar witnesses first-hand the harsh conditions the workers are forced to endure. Because of this suffering and his family, he decides he wants to change the conditions for the workers. After many doubts and hurdles, he finally reaches enough fellow workers that agree and want to follow and support him. In a fight for justice, Cesar forms The National Farm Worker Association. After a long and famous march to the Capitol building with thousands of supporters in tow, they sign the first contract for farm workers, making history. I would use this book in a classroom to teach about social justice issues, particularly worker’s rights. I would also use the book as a standalone to teach about the life of Cesar Chavez. "You cannot close your eyes and your ears to us any longer. You cannot pretend that we do not exist." Este libro me hizo llorar. Esta pequeña biografía de Cesar Chávez, me dejo sin palabras, pero si mucho sentimiento. Todos los historiadores siempre nos dicen que tenemos que aprender de nuestra historia para no repetirla. Pero es tan triste ver lo mucho que nuestra raza ha sufrido, y peor aún saber que este tipo de cosas aun suceden. Que fácil sería tomar la misma postura de odio y discriminación, contra los que nos han abusado siempre, pero como bien nos enseña Cesar Chávez la única forma de triunfar de verdad es por el camino de la no violencia. This book is a biography of Cesar Chavez. It shows his life from the time he was ten years old on his family farm in Arizona. The family loses the farm and goes looking for work in California. There they see the conditions are horrible. The book shows how Cesar Chavez becomes a spokesman for his people working to get conditions and wages improved. Yuyi Morales creates very authentic illustrations that really help to tell the story. She went to the fields where Cesar Chavez had worked and lived to help with the illustrations. I had heard of Cesar Chavez and the boycotts of fruit, but I did not know the story of his life and what led him to protest. This book is good for grades K-3 to discuss Latino history and the conditions the people had to work under. This is a beautifully illustrated history book for elementary school age students. I’ve always admired Cesar Chavez and this book provides some very good introductory information about his life and work, and is told in an interesting manner. Because of what this man stood for, this book could also be used as a discussion starter about civil rights. This story was selected as one of the books for the May 2010 - Latino reads at the Picture-Book Club in the Children's Books Group here at Goodreads. Harvesting Hope is a wonderful book to use when teaching students about Cesar Chavez and what he did to help farmers out. The illustrations of the book are details and the story is written in order for students to understand Cesar Chavez’s story. Children's book. Appropriate level 2nd grade. Big ilustrations. Chicano movement. Chicano history. Cesar Chavez. School reading. Really well done. I loved the illustrations. They convey tremendous emotion and the colors are rich and beautiful. I didn't know much about Cesar Chavez until I read this book. It made me want to read more! Narrative non-fiction with beautiful illustrations. I was glad I read this. Children’s nonfiction book, it is a biography about Cesar Chavez. Having watched the movie, Cesar Chavez: History is Made One Step at a Time; gave me a close idea of what the book was going to be about. I believe that the author did a great job at writing this children’s book and the pictures are very colorful. I loved the flow of the story because it began with a happy boy and ended with a content man. Teachers could use this book to inspire students to solve conflicts in a peaceful manner. Talking to others and raising awareness about an issue is better than seeking revenge and turning to violence in order to solve a problem. Most of the time violence will result in physical and emotional damage to both parties involved. Also, the book can be used in a history class since the main character was an inspiring civil rights leader. After reading this book I would show students an example of a power-point I created about Cesar Chavez (relating to civil rights and his role) and have students chose from a list of civil rights activist and do a power-point of their own. a. What did Cesar’s mother advise him and his siblings to do instead of getting involved in a physical fight? Share a meaningful advise a family member has given you? –She urged them to use their minds and mouths to work out conflicts. My mother always advised me to speak up, but to choose my words carefully because words can be harmful. b. Compare Cesar’s home in Arizona to his first home in California? Have you ever moved to a very different place or want to move somewhere different than where you currently live? –His home in Arizona was an eighty-acres ranch located in the Arizona desert, where his grandfather had built a sturdy, spacious adobe house. There was a vegetable garden, cows and chickens, and hundreds of family members lived in nearby farms. He enjoyed the frequent barbecues with relatives. In California, he lived in a battered old shed with no doors and a dirt floor, where he and his family had to share water and the outdoor toilets with a dozen other families. There was nowhere to play since they lived in a crowded environment, where their neighbors constantly fought. After I got married I moved from Arkansas to Wyoming. I like and miss the state of Arkansas because there is more things to do than in Wyoming, but I like Gillette better than the town I use to live. Gillette is bigger and I really like the school district. c.	What punishment did Cesar receive when he broke a classroom rule that demanded students to speak in English at all times, how did this affect his education? Name a punishment you have received in school? His teacher hung a sign on him that read, I AM A CLOWN, I SPEAK SPANISH. He came to hate school and dropped out to work in the fields full-time after his eight grade graduation. When I was in 6th grade I was chewing gun in gym class and I received a detention. I didn't think it was an outrageous punishment but I wish I would have been given a warning. d.	What did La Causa support and what were Cesar and his supporters able to accomplish? La Causa supported the rights of migrant farm workers, who received cruel and unfair treatment from the landowners. As a result of his peaceful protest, farm workers received a well-deserved pay raise and better working conditions. a. Why did Cesar’s Grandfather build a house with walls that were eighteen inches thick? b. Was the Chavez family able to buy back their ranch in Arizona? How much did it cost? c.	Why did Cesar’s teacher give him such a cruel punishment for speaking in Spanish? Why would any teacher do something so cruel to humiliate a student? d.	Were there any laws to protect farm workers before Cesar Chavez came along? This children's book is about the story of Cesar Chavez. He and his family was forced to move to California during the drought of 1937. His family had to work on farms doing very hard manual labor in the fields. He went to school and thought it would be a safe place, but he felt nothing but safe. English was the only accepted language in schools at the time, so Cesar was not allowed to speak in his native language. Once he did, he was forced to wear a horrible name that called him a clown. After graduating eight grade he felt proud of himself, but he also felt like he needed to quit school and return to the fields to earn money for his family. This was when he realized that the work and treatment the workers were experiencing was not fair. Therefore, he decided to stop and travel around California to spread the word about their mistreatment in hopes of gaining support for his freedom movement. He eventually won the battle and gained respect and more freedom to the farm workers. I loved that the book is based off a true story of a hero. Many children could learn a lot from reading this book. It contains beautiful detailed illustrations. I rated it a four, because it could be a quality read a loud book, but I can see that some students may be turned off by the length of the book. It is definitely for the upper side of elementary grades.